Breitbart’s piece on the accusations more closely resembled a “press release” for Moore than a news story, argued one journalist. Headlined “After Endorsing Democrat in Alabama, Bezos’s Washington Post Plans to Hit Roy Moore with Allegations of Inappropriate Relations with Teenagers; Judge Claims Smear Campaign,” Breitbart‘s piece more closely resembles a “press release” for Moore than a news story, argued the Washington Post‘s Aaron Blake. According to the Post’s account of the allegations, Moore approached 14-year-old Leigh Corfman in 1979 when she was sitting outside of an Etowah County, Alabama courtroom with her mother in 1979. Moore offered to watch Corfman while her mother went inside the courtroom for a child custody hearing, and proceeded to ask her for her phone number.
. . . took off her shirt and pants and removed his clothes. He touched her over her bra and underpants, she says, and guided her hand to touch him over his underwear . 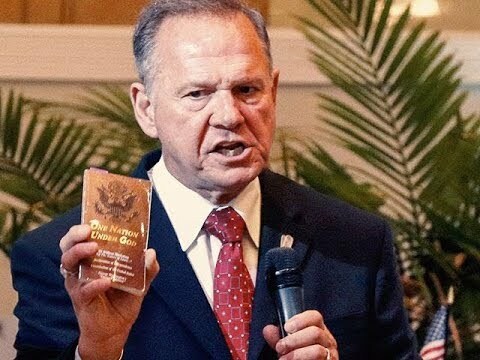 . .
Three other women have also alleged that Moore pursued them when they were between the ages of 16 and 18, the Post reported. One of the women, Wendy Miller, said Moore first approached her when she was 14 and began asking her on dates when she was 16. Lawmakers were quick to respond to the allegations, and many Republicans called on Moore to step down as the party’s Senate nominee. “If there is any truth at all to these horrific allegations, Roy Moore should immediately step aside as a Senate candidate,” Sen. Susan Collins (R-Maine) said in a statement. “He should immediately step aside and allow the people of Alabama to elect a candidate they are proud of,” McCain wrote on Twitter. Moore has been labeled a “bigot” and a “theocratic crackpot” for his record as an Alabama Supreme Court judge. In 2003, Moore garnered national attention when he had a 5,280-pound monument of the 10 Commandments built inside Alabama’s state judicial building. He has also suggested that Muslims should be barred from serving in Congress and that homosexuality should be outlawed.